Back in the olden days, a simple task like sewing or fixing a broken button required many tools and effort to fix it. However, gone are those days due to the birth of glue guns. Not only are they a ton of help in the fabric department, but they also work wonders in the wood, crafts and metal department. What are you waiting for? Get yourself a suitable glue gun based on the guide below, just be sure not to get yourself into any sticky situation! Remember when we used stick glue for our art sessions and had sequins fall out the next day? Well, no more of that! With this amazing glue gun, your crafts will stay intact for a long time and the end product is sure to be sturdy. It is ideal for all sorts of projects such as scrapbooks, fabric DIY and building a model. Get crafting! If you’re a DIY queen and love making new projects, the glue gun is sure to be your best friend. Therefore, having a cordless glue gun is the best gift you can get yourself. It makes completing your projects easier as a power outlet is not necessary and you can use it anywhere. Charge it when you go to bed and you’re all set the next morning! If you’re still using the old fashioned method of nails and hammer when working on wood, then it’s time for a change. Fortunately, glue guns work just as well on wood as it does on other craft materials. This glue gun in specific runs for a long time. It also keeps you protected from any hammer injuries. Glue guns, although mostly used by kids and those who love creating art, can also be used by professionals for serious work. This glue gun comes with many features, one of which is the ability to heat up quickly and automatically adjust the temperature accordingly. This professional tool is sure to come in handy in a variety of situations. Staplers can’t get through metal, and nails will damage it. So what shall you use in times like this? That’s right, a glue gun! Not all glue guns work on metal but this one in specific is made with metal in mind. It also works well on plastic, ceramic glass and wood. This glue gun has a strong body and a heat insulated gun barrel to ensure an extended period of usage. You’ve got a hole in your furniture casing and buying new furniture is not in your budget, so what do you do? Upholstery! A simple solution that will save tons of time and money, plus it only requires one tool – this glue gun! This reliable glue gun has a trigger feed mechanism that will ensure the right amount of glue is used to seal the furniture. It’s as easy as that to up your furniture game. Heavy duty glue guns are not to be messed with – they’re the real game changer! This bad boy heats up in just a minute and is engineered to provide you with reliable performance. The heat of this glue gun is also higher than most glue guns, thus it may burn your skin if it gets in contact with the glue. All that being said, it truly is the real deal and works better than most other options out there. While glue guns are fun to use, they can be very messy at times. If you don’t search for the right one, you might end up with one where the glue continuously pours out from its nozzle. Fret not, we’ve found a solution for that already. This non-drip glue gun comes with a non-drip insulated nozzle which allows you to put your gun down between craft sessions and come back to a mess-free work station. Now, wouldn’t you just love that? 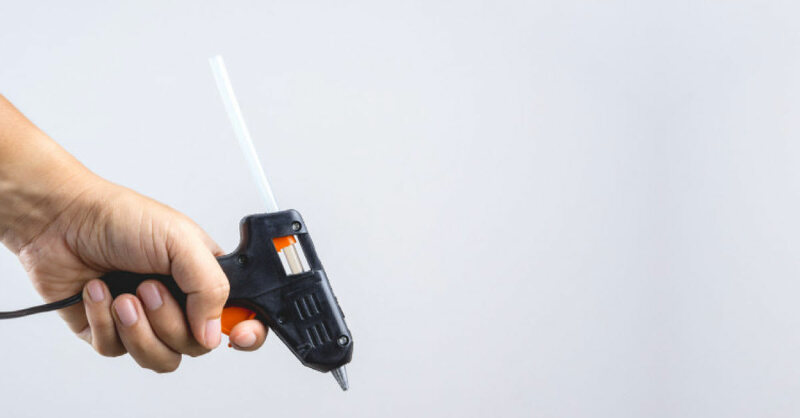 Instead of buying a glue gun made specifically for simple tasks and a separate one for more serious and hard-core tasks, use a dual temperature glue gun instead! In simple terms, a glue gun that will work in both situations. With a simple flick between the high and low-temperature switch, Dual Melt Glue Gun can be used for all sorts of projects. What a steal!